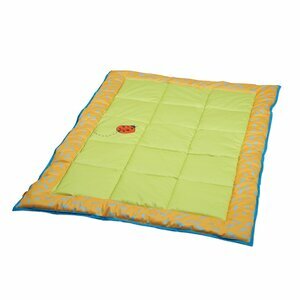 Double Sided Baby Mat Huge, soft baby mat features one side for playing, with colorful and stimulating pictures, baby mirror, multiple textures and tethered lady bug pal. The flip side is for calming baby down and only shows a picture of the lady bug pal heading off to sleep. Comes in storage bag.